Did you ever wonder how job-seekers get screened out or eliminated based on someone looking at their résumés? When a job-seeker is being considered for an open opportunity, the first person who will read their résumé is generally either a recruiter or an HR person. If it’s a recruiter, it could be either a 3rd-party, agency-based head-hunter type, or an internal, company-based corporate recruiter. [Read “The Real Truth About Working With Recruiters” for more on the different types of recruiters and how they work.] If it’s someone in HR, it could be anyone from an entry-level screener to a Director of HR – depending on the size of the company. This screening and elimination process happens when you respond to online job postings, and it also happens during proactive searches for candidates done on résumé banks like CareerBuilder, Monster, etc., or on Social Networks like LinkedIn. Basically, anyone who is looking for and screening potential candidates for an open job opportunity goes through this process. Now I’m sure that you slaved over your résumé for hours and hours, writing and re-writing it, revising, refining and retooling its language until it’s as “perfect” as it can be. If you are like most serious job-seekers, you are hoping that the person who first screens your masterpiece will take their time and read it over very carefully – absorbing every detail of your background, analyzing your qualifications and experience, and making a carefully considered, informed decision about your fit for the position they are trying to fill. Unfortunately, you would be wrong. I hate to break this to you … but the average résumé-reader will give your résumé less than 15 seconds of eyeball time on the first pass. [Read “Beating the Résumé-Elimination Game: Where Do Recruiters’ Eyes Go?” for more on this.] They’ll scan the first page of your résumé, rarely progressing on to the second or third pages. If they don’t quickly see exactly what they think they want or need right up front … bye bye – delete key for you! I know — it sounds pretty brutal, right? 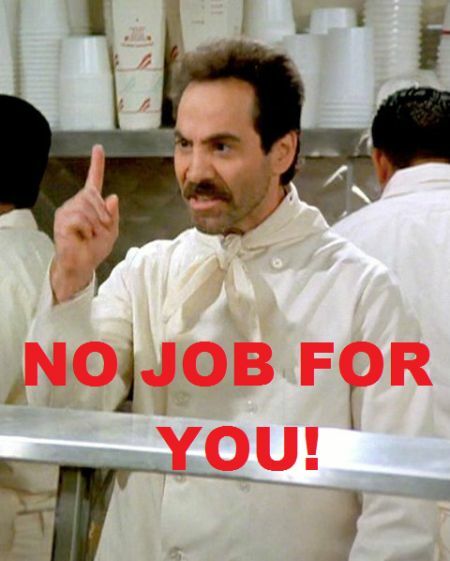 It reminds me of a recruiter’s version of the “Soup Nazi” from Seinfeld! In my many years as a recruiter, I’ve certainly read my share of résumés. There were times when I went through over a hundred a day. I certainly know how this elimination game works! So … what follows is a peek behind the curtain. I make no apologies for how this process works, or how fair or unfair it may be – like it or not, this is simply the way it is. I feel it’s best for job-seekers to be informed about this to be able to better navigate the process and avoid obvious pitfalls as they move forward. 1) “Functional Résumés.” Almost every recruiter and HR person I’ve ever talked with about this agrees – a chronological résumé is essential. It should list the companies where you’ve worked, the dates you were there, and what you did at each place. Every so often I receive a so-called “Functional Résumé” filled with long bulleted lists of undated skills and accomplishments … and then (almost as an after-thought) at the bottom will be a short list of places they worked with no dates. My immediate reaction to that is that they are trying to hide something. Maybe it’s an age thing – or perhaps their experience is outdated. Where and when were those skills used? Where and when did those accomplishments happen? Who knows?! Big red flag. Traditional chronological résumés are the only way to go. 2) Typos, Spelling or Grammatical Errors, Poor Writing. If you are so careless that you can’t even proofread your own résumé, then the assumption is that you would be equally careless with your job performance. 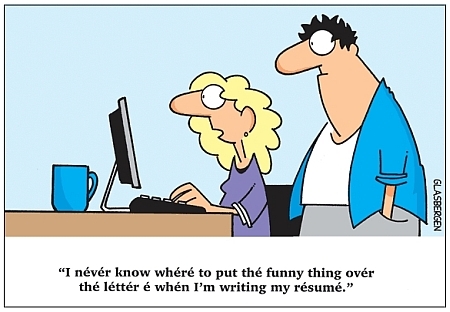 Likewise, using unclear language, rambling, or just having it be too long are traits of a badly written résumé. One to two pages is standard. Three pages may work in rare cases (e.g highly technical roles) but anything beyond that is simply too long. Don’t make the reader work too hard to see the basics. If someone can’t figure out what you do by quickly glancing at the top third of the first page of your résumé … that’s a huge red flag. 3) An Incomplete Profile on LinkedIn. By this I mean profiles that do not provide a full, relevant employment history, do not include details about specific skills and experience, and (to my total amazement) do not even include basic contact information! Sending messages through LinkedIn’s own internal system should never be the only way to reach someone. How does any job-seeker expect to be “found” by a recruiter or a company if they don’t even include a direct email address or a phone number?! Every day I see so many profiles that only list job titles, with absolutely no details below each position describing what the person did at those places. The fact is many people now apply for job postings using their LinkedIn profiles instead of sending traditional résumés. Also, many recruiters and HR professionals now routinely search for candidates using LinkedIn profiles instead of viewing traditional résumés. Incomplete LinkedIn profiles are completely ineffective, and actually reflect poorly on anyone who creates one. Keyword searches are usually the first method used to find résumés with specific skills that match job descriptions. If the right words or phrases are not present in your résumé or profile, you simply won’t come up in a search done by a recruiter or an HR person. It would be naïve to think that someone will “read between the lines” on your résumé and realize that you have the skills they need even though they are not spelled out, or that anyone will understand the subtle details of your experience without you clearly stating them. You should modify and tailor your résumé to each individual job you are applying to, using the language contained in the job description. If your résumé does not contain the exact buzzwords or phrases that match the language of the requirements listed in the company’s job description … bye bye – delete key for you. With very few exceptions, candidates must live in the same geographic area as the job. You may say you are willing to relocate … but that’s a potential headache for the company who hires you compared to a local candidate. If your résumé shows that you currently live in a different place than the job … bye bye – delete key for you. In most cases, you must come from the same industry as the job. For example, if the job is in the Financial Services industry and you come from Manufacturing bye bye – delete key for you. Moving from one job function to another that you’ve had little or no experience with is an uphill battle. For example, if they are looking for someone with a sales background, but you have never actually been in a sales role … bye bye – delete key for you. If they are looking for an individual contributor, and you’ve been at a much higher level – say managing other people or a department … it’s not a match. Conversely, if they are looking for a Manager or a VP or a C-Level Executive, and you’ve never held those titles … bye bye – delete key for you. If the job description calls for someone with 3-5 years of experience, and you’ve had 10-15 years … it’s not a match. And if the specific experience they are looking for is actually listed on your résumé – but it occurred many years and several jobs ago, and you’ve done other unrelated things since then … bye bye – delete key for you. Some companies require a college degree, or a specific type of certification. If they say you must have a B.A. and all you’ve got is an Associate’s Degree – or no degree at all … bye bye – delete key for you. If your job history shows too many short stints over a limited time period, it can read as a negative: you might be a job-hopping flight risk … you seemingly can’t hold down a job … perhaps you don’t get along with others well … there may have been performance issues that got you fired – the imagination creates all kinds of possible scenarios! Likewise, significant unexplained gaps between jobs can be red flags that will get you eliminated. There may be perfectly valid reasons for having a lot of jobs within a short period (mass layoffs, position was eliminated, company went out of business, etc.) I would advise briefly listing the reasons for short job stints right next to the dates on your résumé to avoid this obvious red flag. [Read “Explaining Short Job Stints and Employment Gaps” for more details on handling this issue.] But unless you can effectively explain those circumstances … bye bye – delete key for you. This one is a biggie – and obviously would not be listed on your résumé, but rather will often come up when filling out an online application. If asked point blank what you made at your last job, or what your salary expectations are going forward – don’t play games or avoid answering. If you dance around this issue and/or refuse to give a straight answer, then it will likely raise a red flag that will get you eliminated. There are simply too many qualified applicants for every open job for recruiters or HR people to want to deal with someone who can’t give a straightforward answer on this. [Read “Answering the Dreaded Salary Question” for more details on how to handle this issue.] The bottom line is that if your salary history and the range you give for your salary expectations going forward do not overlap with the company’s budgeted range for the specific job you are applying to … bye bye – delete key for you. Entry filed under: Advice for Job Seekers. Tags: interviewing, job-seekers, resume, unemployment. Great post. Interesting that with my clients, we find that a “functional” resume works best in getting in front of hiring/decision makers, but not recruiters and HR folk. To me your points illustrate that HR is more concerned with filling positions rather than acquiring talent. You would be right if the interview were not part of the hiring process. As I explain in a post below, the resume is a screening tool, not a selection tool. The truth is, the best resumes aren’t necessarily written by the applicants themselves. In fact, most people receive help with their resumes and are told what behaviours, verbs, and keywords to use. The interview is the only way to get information from the applicant directly. Since interviews take about an hour each, it is important to filter your candidate pool before hand, hence the resume. I too agree that there is only a cursory glance at the front page of any CV. If we don’t see what we’re looking for the other pages will be missed. I always suggest that candidates should be ready to tailor thier resumes to each job description – so that the reviewer will match the candidate to the requirements easily. I also suggest that you review your CV before each mail out… too often I recieve cover letters addressed to different companies!! With LinkedIn and online postings of resumes, I’ve wrestled with how much information is appropriate, and how much creates a potential security concern. I started including address and phone number, but backed off to only providing my email address and the metro area I live in after receiving some unwanted job solicitations, and reading some warnings about online privacy/security. On LinkedIn, it seems that many other profiles I see only provide email address, some a phone number or address, and some put out nothing.What is your take on how much contact information is enough? At a minimum, I think that providing an email address is essential. If you are worried about privacy or security – then create a separate email address just for your job search. Just make sure you monitor it regularly. I also prefer seeing a phone number … but I understand if you are reluctant to list that. However, I’ve never really had a problem with unsolicited phone calls. I’m okay with putting my regular email address out. The phone calls I got were from pyramind-scheme type companies who prowl the internet and various networking events. Also there were some commission only sales jobs – I’ve never done sales. I’ve always been in trade (B2B) magazine publishing, which is very difficult right now. I totally agree with you Michael. You spent hours trying to get your resume the best ever and even though in most cases, you don´t pass the first filter, which sometimes it is done by a computer screening your resume for key words, and it they are not there, the system just delete it without giving you a chance to be considered. I understand that time in such processes is critical but it still is all about people hiring people. I believe you have had the experience of hiring someone that was so good in writing the best resume ever and at the end it was a fraud. It happens all the time, everywhere. What people must keep in mind is that information flows too fast, providing candidates with tips to avoid mistakes in their resumes, that way, preventing them to be deleted at the first round. This article, while more than likely truthful, is horribly discouraging. As a very skilled and talented person who is currently unemployed and looking for work, it feels hopeless when there is a list a mile long that supposedly gets you a delete button. how on earth is anyone getting hired by anyone? what a disappointing society we live in. Look at it this way if you went to a butchers and asked for a leg of lamb but he offered you every other piece of meat available from pork to beef to chicken and including all the marinated options how frustrated would you be? Or you would rather it was a simple straight forward transaction whereby you got what you asked for or close to what you asked for? Come spend a day in my shoes and you’ll see exactly how frustrating it is when you get resumes so far off the mark you wonder what planet people are on when they are applying for positions. I can understand the usefulness of this advice, it is good to know. But its also a very sad statement on the whole recruiting process these days. Like you said I am sure that a lot of people submit resumes when they are not at all qualified for the position they are applying for, and I can understand that this can be frustrating. But there is a happy medium, and after reading this article it appears to me that the role of a recruiter or HR person is no longer to actually work at finding the best fit, but to simply find reasons, any reason, to eliminate resumes from the pile. It also strongly implies that if you want a job that is slightly above your level, or is in a slightly different area than what you currently work in, you can forget it. You are basically relegated to the exact same role and the exact same level you are currently working in, and any attempt to go outside of that will get you a big “delete”. It just doesn’t give me a whole lot of confidence in the whole system. I feel like even if i am perfectly qualified for a position in every possible way, the person reading my resume will almost be actively searching for a reason to toss my resume in the trash. Discouraging, if you want to relocate and move, you can’t get a job first. If you have tons of experience and talent and have actually done the job being advertised but lack the degree you go in the no pile. You see it as five minutes – it is an impossible barrier. All to make the HR person’s job easier. Add that to the fact I know tons of folks who look good on paper, exceptional, but they won’t get your job done. It is almost laughable to watch them going from organization, to organization leaving it worse than when they got there. But hey, they look good on paper and they have a Masters Degree. Once upon a time, it was good to work yourself up an organization and you didn’t need a degree to answer the phones. The truth of the matter is, it is not plausible to accept everyone that could POSSIBLY fill a vacancy. After screening out resumes, you have to conduct an interview with all your possible candidates. If you simply pick a few out of the massive bundle you end up with, you are opening yourself up for a discrimination lawsuit. Note, the burden of proof lies on the employer. If that employer cannot provide a reasonable reason for interviewing one candidate and not another, they will be in big trouble. As it always has been, the best way to jump start your career is through networking. An employer has every right to trust a referral over an unknown applicant. This is how most people get jobs, not by applying everywhere, but by building strong relationships with people within their industry, gaining their trust and simply asking them if they know of any opportunities. Anyone can open up a door for you, which is why you should never discard a contact. If you truly are good at what you do and are deserving of moving up the ladder, people will notice. Croy, I totally agree. It is sad that the “human” element has been taken out of “human resources.” I personally feel that some of the requirements for a job are placed to eliminate certain groups. In the retail industry, most of the “actual” job requirements center around sound decision making and common sense — things a degree will never get you. While you may need an accounting degree for certain financial jobs, a retail manager can usually compute mathematical computations and be extremely successful in managing a store. Creative minds dictate in this industry. You don’t need a college degree for that, just experience! Resumes are tools to screen applicant pools, not selection tools (that is what the interview is for). The most important thing is to assure that your resume clearly demonstrates that you possess all or most of the job requirements in the job description. If you do not know the job requirements, understand that the recruiter will be looking for specific, tangible details. Technical skills, length of experience, the fields you’ve had experience working in, degrees, and specialties all need to be obvious in your resume. Everything extra in the eyes of the recruiter WILL be ignored. Michael, tell me if I am wrong, but email and phones are not available as part of your LinkedIn profile until you are directly linked with someone (and email only). So how do you include your email and phone? Also I have the same security concern as Dan. You can easily include your email address and/or phone number in the summary section of your profile, which is visible to anyone. You can also add multiple email addresses as well as phone numbers in your “Contact Information” section which, as you pointed out, is only visible to people after you connect with them. And finally, there are several ways to include a link to your actual Word-formatted Resume document (also visible to anyone) which would normally contain your full contact information. Great article lets hope the word gets out and our lives are make easier = we can help more people get their perfect job. A large number of positions I recruit are branded adverts (include the company name & logo), we clearly advertising asking candidates to include a cover letter stating your interest in working with this organisation. In the case that you dont include a cover letter I will only read your resume if I have a spare few minutes in my day. If you go as far as flicking me a resume attached to an email with only the reference number in the subject but no body in the email then my line is harsh – your application appears rude, my response is rude – Delete. Bravo !!!!!! I know I have scratched my head several times and often felt that what you are saying is truly what is going on. Not only did you address the reality of this often times felt process, but let’s add in the personal references (i.e; friends, friends of friends….). Hiring managers will often lean on their decision based on personal references from a friend or colleague before they actually dissect your resume. I have seen positions that need to be filled quickly are often filled again soon as the right candidate search and resume process was overlooked. I would like to think that seekers hard efforts and time in resume building would be appreciated more, but in reality you are correct. If you don’t capture your high point’s right out of the shoot then you stand to be in the deleted file quickly. Also remember, if you are Superman / Wonder Woman then express that. If your not…… Be honest. Don’t waste someone’s time and your reputation for false representation. We are who we are and if you get the interview it will be based on facts. Great post, Michael. I will share with my Tuesdays with Transitioners group. It’s been hard to drill into their heads that shaping the resume is simply NOT enough, but a fine-tuned resume that follows the networking and other forms of direct contact will give them an edge. Another brutal truth is that there isn’t a “perfect resume.” There are hundreds of job sites telling people how to write the perfect resume. All of them can’t possibly be right since they are all different. Be unique, original and don’t waste the reader’s time. You get 1 page. Make the most of it. More than that and you’re wasting your time. What works for one employer may be trash to the next. It pays to take time to tailor each resume to each prospective employer. Great article.Now i know why?Its the hard truth.Thanks alot. Nice to find someone having such a long and in-depth experience in HR recruitment. Would you be kind enough to let me know some tips on resume writing. In France it is normal to send a photo and a hand written letter of motivation with your application. When faced with 100+ applications to go through for a secretarial post, I immediately discarded any that had photocopied letters and any that had the applicant wearing oversized earrings. Both of which I considered as showing the applicant not having a professional approach. You are absolutely right! I am presently producing two DVDs in Spanish, one about resumes and the other about interviews. We interviewed 12 of the top HR executives in Puerto Rico for over two hours each. They all have employees that go through resumes looking for the exact job requirements posted on the employment ad. If they don’t see what they’re looking for you’re history! These DVDs will be available on our website on or before July 31, 2010. We also have other titles available. All of our programs are in NTSC format in Spanish. Maybe it’s just me (and it probably is), but why is a recruiter using a LinkedIn profile to base their intent on reviewing a resume’ that has been prepared? A person who took the time to prepare a resume more than likely goes into detail. A LinkedIn profile is sometimes an overview. I never review a LinkedIn profile to screen an applicant to be passed on. The resume’ was sent for that reason. I am continuing to see why we have the struggles in our society, because not enough people take the time to care. I’m not saying you need to sit and read resumes that clearly were not well-prepared, but to dismiss resumes for some of these reasons allow very talented people to be over-looked. I want people who can be innovative and bring bright ideas to my companies. It’s about moving forward and not holding them back because they don’t meet “corporate crap criteria.” Let’s stop playing mind games and help people get back to work. Sometimes it may be doing jobs they’ve never done before, but they may actually be well-suited for and a different perspective may grow the business. This may be their perfect opportunity, and your company’s best hire! Just to clarify … recruiters do not review LinkedIn profiles instead of resumes. They do advanced searches on LinkedIn to identify potential matches for the jobs they are working on. Many of those potential matches are “passive” (non-job-seeking) candidates who would not answer a job posting or send their resume to a company or a recruiter without being contacted first. If a recruiter finds a person of interest based on their LinkedIn profile, they will then request a full formal resume from that person. SO – my point is that if a job-seeker wishes to be “found” through one of those LinkedIn searches, it would be in their best interest to expand their profile to include details and keywords that will attract someone in their industry niche. Those “innovative” and “bright ideas” you speak of will be more likely to come out in an interview setting than on a resume or a profile. The trick is to pass the initial screening stage in order to get to the interview! Good article. Typically I’ve seen 50+ resumes for one job posting. During the recession that could jump to 120 or more. I weed out first by typos or bad grammar (which unfortunately cuts out quite a few people). I then sift back through and dump anyone that has changed jobs every 12-24 months. Unless I see a great explanation for frequent job change, I consider these “jobhoppers” that will leave at the first offer to make 50 cents more per hour. I don’t want to waste my time or resources training someone that will not stick. I expect a cover letter with all resumes that addresses the points in the advertising, including past salary history. I expect a follow up letter or thank you card by all interviewees. Handwritten notes are fine if it is a card format. If you decide to send a letter, I expect everything to be typed, including the envelope. You mention that if you are in a different location than the company, your resume will not be considered. What advice would you give someone who would like to relocate? One thing you can do is create a duplicate profile for yourself on LinkedIn (using a different email address) with a physical address that is local to the place you want to relocate to. That way, you’ll come up in searches based on that location. Of course, if you do get called for an interview – you’ll have to deal with getting yourself there to meet face-to-face. Sooner or later in that process you’ll have to reveal the truth about where you live … but at least you won’t be eliminated in the initial screening stage. so aside from LinkedIn, when sending a resume to a company, its also advisable to put an address on the resume local to the place you want to relocate to? If you can, then yes … I think it makes sense to be consistent. won’t the employer be a little leery of the fact that you lied on your resume, once they do find out the truth? it seems a little odd to me to put a blatant lie on your resume just for the sake of getting past the inital screening. If you establish a legitimate local address in the city you are targeting (a friend, family member, etc.) for the purpose of conducting a remote job search there, and then immediately explain that to whoever contacts you … I don’t think it will be perceived as a “lie.” Otherwise, you probably won’t ever get contacted at all. Just be honest with them right away when they do reach out to you! Offering to relocate at your own expense, and already having a local base from which you can operate are two things that can only help your situation. Great topic! I’ve read your comments and I think some explain things, some do not and raise questions. @Andrea Frymire: “dump anyone that has changed jobs every 12-24 months. Unless I see a great explanation for frequent job change, I consider these “jobhoppers” that will leave at the first offer to make 50 cents more per hour.” – I’m curious, what is wrong with this? I mean, even if the job attracted me at the beginning and after 6 months I realized that is not what I wanted or at least, I’ve hoped to be, should I have stood there for at least 12-24 months? Is it a minimum period to remain employed within a company? In my opinion, there is not. Regarding the reasons for leaving, should they be highlighted into CV? Why? I consider that a prospective employer should ask me “why” in the moment when he is interested of me, as a candidate for that advertised position. Also, why to include a past salary history? You are going to offer me a salary depending on my last salary? Why? I guess you have a budget (+/- x) or certain salary grills. In the end, I would like a frank answer, as Len Costa asked above, regarding the key-factor(s) needed for a candidate to be successful when applying for jobs. 1. Because it is expensive and time intensive to interview and recruit new staff. Best case it will take 30 days start to finish. I’ve had it take as long as 3 months to find the right person. 2. Because most positions we are filling have a 3-6 month training period. I don’t want to train someone that will not stick around. 3. It’s been my experience with previous hires that had a jobhopping background that they always thought the grass was greener somewhere else and they never were satisfied. Not with any of their previous jobs nor any that I had available. 4. Others can weigh in but I personally view frequent job changes as high risk for turnover. 5. On highlighting reasons for leaving – I’d only highlight if you’ve had frequent job changes. Otherwise, my guess is you won’t even make it to the interview stage to explain your Whys. In regards to salary history, I want to make sure candidates expectations are in line with our salary ranges. Otherwise it is a waste of everyone’s time. If I was in a job search I would want my salary history known because I wouldn’t want to waste time interviewing with a company that can’t reach the level I would require. The recession has had dramatic changes on the resumes I’ve seen the past 18 months. We’ve seen excellent, even over-qualified candidates. In some instances we’ve upped our typical salary and/or benefits package because the candidate brought so much extra to the table. We typically hire interns every summer (this year we are not because business is slow). Last years resumes for interns were incredible. We had MBA grads, law students, etc. Typically we are hiring juniors or seniors. Last year our interns already had undergrad degrees and were either in law school or working on MBAs. I’d ask for any headhunters out there to verify but another big reason someone would avoid jobhoppers is that if you are using an agency or headhunter it is really expensive. I’ve had to pay up to 30% of the salary for the headhunter service. Generally, a portion is paid at the time you retain the services (1/3), another 1/3 at the time of hire and the final 1/3 at some date in the future (most recent I’ve used is at the 1 year anniversary date of hire). All of the services I’ve used have provided some credit towards the next service or partial refund if the employee didn’t stay, however, I think you’d find an employer as well as a headhunter reluctant to place a jobhopper if they think they won’t stick around long. Again, I’d recommend verifying this with a headhunter or employment agency but that is my experience with several groups for mid and senior level positions. I think that both of your replies are dead-on accurate! There’s a huge difference between someone who leaves a job because it was either clearly misrepresented, or due to some unethical or unprofessional behavior on the part of the company, and someone who thinks it’s OK to leave a new job after a few months just because they get a slightly better offer elsewhere. For such a person to ask “what is wrong with this?” shows that they are clearly a high-risk hire – buyer beware! The demonstrated ability to make a professional commitment and follow through with it is a trait every company looks for. Thank you. Both to Michael Spiro and all of the wonderful people who contributed comments on LinkedIn. This clear, honest look at the way resumes are reviewed is refreshing and helpful to me – a person who will soon be seeking a new position due to my current employer transferring operations to an out of state location. This article and several others I’ve found allow me to approach my upcoming job search with a better understanding of the potential employer’s perspective. Again, thank you. As Director of Talent Acquisition for a Defense Contractor, I engage in searches for candidates more than “recruiting” candidates. For the most part we, by corporate design, look for the passive, already working, individual. This would be true even for Technicians and definitetly true for C level openings. To be sure, within our industry there are certain competencies that would qualify as niche competencies. Mostly we require very high clearances be held by candidates and those clearances need to be active. Therefore, character, integrity and squeaky clean backgrounds are essential. in the position. Frankly, most don’t know the difference between a balance sheet and an income statement and couldn’t determine the COGS of a position filled. Understanding the business from the ground up is a demanding and time consuming effort that most “recruiters” are unwilling to undertake. This may seem harsh, but in my career, I have met only a handfull of what I would consider Excellent Talent Acquisition Professionals. I consider myself to be one of the best, though I have a few heros in the field who are better than me. A true Talent Acquisition executive must have the ability to close the deal and make the offer on the spot if necessary. People who are looking for a job are of no interest to me. People who want to make a difference, have the drive and competencies we seek and will fit into our culture are my targets. I am personally driven to find the best and work nights, weekends, on vacation and will try practically anything to get the interview, begin a new network of contacts, make myself available. Most young “recruiters” are reluctant to be that dedicated. While on vacation on Maui I made the acquaintence of an individual on the beach–we wound up hiring him. That’s Talent Acquisition. This is an excellent article on how resumes are sorted from their job postings. As a current job seeker, I found this to be one of the better articles I have read on how to get my resume noticed. Well done! Functional resumes just don’t function…glad you called that out front and center. when all is said and done, the process is a two way street. gretchen, thank you for your comments, you seem to be the only one on here who gets my point of view. i am very appreciative of employers who actually take the time to read my resume and can see where my abilities would be a good fit. i am a very professional conscientious employee, and i have the references to prove it. if some recruiter is going to toss my resume based on the fact that my last job only lasted 8 months (when in fact i got laid off), or because they don’t quite like the font i used, or some other trivial detail simply because they’re trying to make the pile smaller, then its not a place i would want to work anyway. Thank you for posting these tips for how resumes are reviewed. I haven’t read something this immediately useful and direct in a long time. As a job seeker who will celebrate 😦 one year of being laid off on June 22nd, I appreciate the blogs. For instance, I haven’t been getting many call backs from recruiters, so I have been looking for ways to improve my resume. I have been looking into the functional resume as an alternative. Since seeing mixed reviews and now Mr. Sprio’s comments I will stay away from it. I will continue to read your blog in hopes that some of your advise sink in and lead me to a new career. I have been in HR for 20 years. When it come to recruiting, your articles are some of the best I have read! You are giving people a back stage pass to the recruiting world. It may seem harsh to some job seekers, but, to quote a great blogger, it’s “The Brutal Truth…”. Thank you for sharing your exeriences and insights in such a thoughtful and eloquent way. I would like to get some advice regarding my current situation. I have been an entrepreneur since the age of eight. The only jobs I have held over the past thirty-six years have been temporary assignments which I took to occupy my time and generate income in between projects. I am now seeking employment in Russia or the CIS, though I have never conducted a job search and have no verifiable employment history, credit history, or references. I have recently opened two blogs, one which focuses on my business experiences in Siberia and another which offers a free copy of the dyslexia book which I self-published and marketed to schools and libraries worldwide. I realize that my best chance of obtaining gainful employment is to network with business owners who can appreciate an applicant with my experiences. The enlightening article posted by Michael Spiro highlights the obstacles which I would face by working through the HR division of a company. To give you some idea of the volume of resumes that are sent to one ad–this past weekend, I posted an ad. Within 24 hours, I had over 70 responses. Less than a third of those met the qualifications and were sent to the hiring manager, We have scheduled then 4 interviews for 3 three openings. The vast majority of those who did not meet the first screening did not have any experience in our industry. In our ad, we specifically stated experience was required. This is not uncommon–people applying for positions for which they do not have experience required (not just desired/wanted as is the case for entry level positions). If you are applying for a position, the easier you make it for the first person reviewing your information to gather the information and identify you as someone with the skills and experience the better. Simple is better than elaborate. For those of you who can quantify results-put the results in the first few lines for each position. Most business people are number driven first and will be drawn to the visual of a number–then you continue to educate them about your experience with how you present your results. Cover letters ARE good to explain relocation as noted above. Accounting for any gaps in employment (laid off, school, raising children). Answer those unanswered questions rather than allowing the reviewer to come up with their own answer. If you do not meet the requirements of the job, trust that the employer truly does require those skills/that experience and that they will not consider candidates with out it. Target your application to those companies and positions that match what you need/want in your next job. Spelling counts. Neatness counts. Accuracy counts. Detail counts. At least once a week I receive a resume with a list of email addresses they are sending their resume to for open positions. I want someone who wants to work for MY COMPANY, not just any company. Hi, nice post! It is really informative and useful for me. Michael – with experience as both corporate and agency recruiting you article hits home with me. There isn’t enough time in the day to read through every resume received and the cover letter. If the resume meets the requirement, then I go back and read the cover letter. Also, if the resume is longer than the candidates years of experience – it’s deleted. I job hopped annually for the first odd 10 years of my career. Nothing like moving along to grab experience. I’ve covered most areas in my field in those 10 years. I’ve been offered brutal pay rises and even an associateship to remain, but I was hungry for knowledge. I’ve been the first screen to hiring people in a previous company where I dedicated six years of my life, and I would prefer the job hoppers as they are people that are willing to go beyond their comfort envelope. You are a rare exception to the rule! Most recruiters and HR people do NOT look favorably on job-hoppers. You nailed it! This is a “must read” for job seekers. Unfortunately everything you shared I had to learn the hard way … glad I learned from my mistakes and am now gainfully employed!! Michael, I preach the 30 second rule to people I advise but there is another monster lurking…Word/Text recogintion search software. In simple English…it searches for ‘KEY” words in a resume before someone even sees them for 1 second. They do send a nice auto reply though. Tip: Make sure you pepper your resume with the “Key” words that directly relate to the top 3 responsibilities of the position being applied for. ie: COO = P & L Good luck and thanks Michael! I read the article, but answer me this: I graduated from school (2 BA’s, dean’s list) 1 1/2 years ago, while I went to school I worked full-time in a B2B company and got promoted over the course of time. Since then I have only been able to get jobs as a commission-only sales associate in retail. I was previously located in a part of the US that feels more like a depression than a recession, so I moved to NYC, working in a retail sales job. I have been applying online left and right but I have yet to get a single interview. I have been told that my resume is very clear to read and direct, however my relevant job experience is on the second page, and I have been unable to trim it down to one page. To top everything off, I have met quite a few people who have positions that I could easily do, yet they don’t have my experience, knowledge or even passion… it’s utterly frustrating. Your problem is difficult to diagnose based on what you’ve written here. You didn’t really tell me what type of job you actually are looking for (if not a commission-based sales position) or why your “relevant” job experience (is it the B2B sales?) can’t be listed up front on the first page of your resume. In addition to reading this blog on how résumés get eliminated, I suggest you also read “The Résumé Test & Checklist: Does Yours Pass?” Clearly, you need some help revamping your résumé to attract the attention of decision-makers in your target companies. You may be also experiencing the “Underqualified” problem common for younger job-seekers who are only a couple of years out of college. If so, you might want to also read “Advice for Recent Grads and Career-Changers” for insight into that issue. Good luck with your search. I am looking for something in Buying / Planning or Marketing; preferably in the fashion industry, but honestly at this point I’ll take any industry in which I can grow. My relevant job experience is buying / planing and marketing. The first page of my resume shows two retail sales jobs and one short stint at marketing company as head of research. The second page shows 5 1/2 years at the company I worked full-time while going to school, a marketing / planning job and a retail buying position. I only graduated a 1/2 years ago, but I took a few years off after HS to work. Read the blogs I suggested, and try putting your most relevant experience on page one. Don’t list the retail stuff at all if you don’t want to do that type of work anymore. Very true Michael. Congratulations for honesty. Indeed when you have 20 positions in recruting process you have to adapt your strategy for having efficiency. If you are paying attention for just 5 minutes to a CV and you have 50 CV on each position, then you need quit a long time. You look for details, if the persons has not the studies, experience, languages, location you are looking for then you pass on. Thanks for sharing your insight, Michael. Paula Rauenbuehler gives us a glimpse of how competitive the job markets are. When there’re hundreds of applications to screen, recruiters / HR personnel have to look at them very quickly. In order to be short-listed or to score an interview with respective employer / agency, candidates have got to tailor their selling tools (i.e. CV and cover letter) to positions they apply for. Think from the recruiters’ / employers’ point of view, you would like to indicate you possess all the competencies required for the positions. In other words, candidates have to demonstrated all the skills, experience, training, published work, etc that are relevant to the selection criteria of the posts. In addition, it’s paramount to make sure CVs and cover letters are well presented as Paula mentioned above. Content in your documents represent how your logic flow. If candidates don’t understand what they’ve written in their applications, recruiters / HR people won’t either. Try to make your experience as tangible as possible and remember not to exaggerate because recruiters / HR personnel will find out one way of another, during interviews or reference checking. Numbers sell, mistakes don’t. Exaggeration no-no! Racheal Sidi • Hallo Micheal Good Info, is there a format for using when applying to Non Profit organisation, I have posted mine recently and there is still no reply on the same, kindly advice. Speaking as someone who currently works at a nonprofit, I would say No, there is no set resume format for them. The best advice I could give would be to make sure that any prior paid or volunteer work experience with nonprofits stands out more, perhaps by using a Functional rather than a Chronological format. Good Luck! As noted in the blog article above (#2 under “Deal-Killers”) … the vast majority of recruiters and HR professionals prefer seeing chronological resumes — not functional resumes. However, to each their own. Whatever works best for you! Michael, great points and very aptly put. My 2 cents: Also if you use too many fonts,boldface or italicise, underline relentlessly, it actually has the opposite effect on the reader. I’ve coached many people who have lost their jobs due to redundancy, and who have taken the opportunity to pursue a change in career direction, or job focus. I advocate they use either a combination style or functional style resume as I explain here. This style of resume has regularly produced the required result – at least an interview. And, I absolutely agree on the importance of tailoring the resume and the cover letter – generic approaches don’t work. Only for fun at home these days! Thanks for the great article. I graduated in 2010 and i just completed a year long professional marketing qualification. I would like to have a career in marketing but my only major employment was as a financial analyst for a year long placement programme while i was at university. My question is, seeing as the only experience I have in marketing is from my qualification/modules studied at university and part time sales roles, is there any advice you could give when tailoring my CV? Usually when I get calls from recruiters some ask why im switching career fields and I was also called a jobhopper by one recruiter (after rejecting my application). The answer to your question can be found in another blog article I wrote with advice aimed specifically at recent graduates. You might want to check out “Advice for Recent Grads and Career-Changers.” That posting contains specific strategies on how to position yourself on your résumé when you’ve had little or no experience in the field in which you are seeking employment. Hope this is also helpful! Thank you, I have all your articles opened in tabs and i’m going through each of them as I type this. Learning a lot from them. Thanks again. I am in a tough situation right now and desperately needed your advice. I just was asked to forcefully resign at my current company that I have been at for 8 months. I still have 2 weeks on the payroll. I am very distraught about this although from the beginning I knew this company was not a fit for me. Previous to this I was at a Contract Sales company for 8 months till I got this job. Prior to that I was at a Pharmaceutical company for for 3 years before they laid me off in a massive 3000 representative lay off. Prior to that I was at a company for 1 year and prior to that I was another big pharma company for 1.5 years. Now, I have been in this industry for 7 years and have held 5 positions and although I have excellent experience and good sales, I am really concerned as to if this will seem like job hopping and exactly how to explain this on the resume and during an interview. Especially with my short 7 month stint with my current company. Any advice on this matter would really be helpful. Thank you. You didn’t really explain why you were “asked to forcefully resign” your current job after only 8 months. Saying you knew it was “not a fit for you” is not really an explanation. You also didn’t explain why you left those other prior companies after only 8 months, 1 year, and 1.5 years. The most important thing you need to do when you have a short job listed on your resume is provide a reasonable explanation for why the job ended. Saying “massive lay-offs” after a 3-year job is fine. Saying nothing after a brief stint somewhere is not fine. Without an explanation, someone might assume that you were let go from all those short jobs “for cause” or for poor performance, etc. Brief explanations will help you avoid being labeled a “job hopper.” Hope that helps. Thank you for your response. I appreciate it. I am still at the current position. The job for 8 months was a contract work which did not end but I got a permanent position during that time and i jumped on the opportunity to go permanent. The position for 1.5 years- I relocated to another city. The position for 1 year. Do you suggest that I put these reasons below each job title? Does this not seem like I am highlighting something that may not even be an issue? Yes … that’s exactly what you need to do! A couple of words explaining why each job ended will solve more problems than they might create. To me, this suggests that serious job seekers should not bother with this degrading crawl on the belly to appease HR and should instead devote all of that resume-perfecting energy to networking. Find someone who wants to hire you and let them champion your cause to HR. I figured that being out of state or across the country from a potential job made it more difficult to earn an interview, but I never knew it was such a kiss of death. Do you have any advice for someone looking to relocate aside from moving first and job hunting second? If you know someone who lives in the city you are planning to relocate to (e.g. a family member, or a good friend) one thing you can do is create a duplicate profile (and resume) for yourself on LinkedIn using a different email address with that person’s local physical address. That way, you’ll come up in searches based on that location. Of course, if you do get called for an interview – you’ll have to deal with getting yourself there to meet face-to-face. And sooner or later in that process you’ll have to reveal the truth about where you live … but at least you won’t be eliminated in the initial screening stage. Lots of good helpful information in here that I can utilize to improve my resume. Thank you for taking the time to post it all. There is one point though that doesn’t help…. As a stay at home mom of four kids, this is a point that could not be helped nor can it be changed at this time. It would be more helpful if you could offer tips on how to overcome this objection rather just say “bye bye – delete key for you”. All other tips you offer are helpful, and changeable, this one is not. Any suggestions on overcoming this one? I’m glad this blog has been helpful to you. However, I must disagree with your assessment that “all the other tips are changeable.” Certain red flags like wrong industry, wrong function, wrong level, wrong number of years of experience, too much job turnover … those things are all part of a person’s job history, and are mostly NOT changeable. And like it or not, fair or not, they will cause most recruiters and HR screeners to eliminate applicants. In your case, you took a lot of time off to raise your family. I personally admire and applaud that choice. I’ve got 4 kids myself, and I wouldn’t have it any other way! However, having said that, you must recognize that the attitude and behavior of the people who screen resumes is not always so sympathetic to such things. The bottom line is that if your relevant job experience occurred many years ago, and you’ve basically been out of your field for a long time — like it or not, fair or not, it WILL get you eliminated by most screeners. The only solution I can offer is that you must somehow find a way to demonstrate that you have recent experience in your field — even if it’s not in a formal job setting.